When Kit MacKlenna returned to her soul mate in the 19th century, Elliott Fraser thought he would never see his beloved goddaughter again. 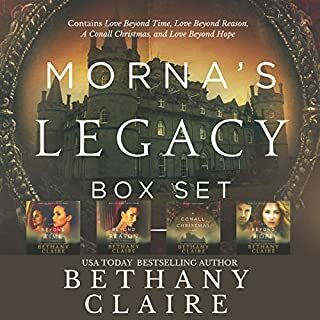 But when a message from Kit is discovered in a 135-year-old painting, Elliot must either ignore Kit's request for help or test the Legend of the Three Brooches. Will the combined magic of the ruby, sapphire, and emerald open a door to the past, and who will volunteer for an experimental trip? David McBain volunteers to go, but he and Kenzie are expecting a baby. Braham McCabe volunteers to go, but he died in 1869. Kevin Allen volunteers to go, but he's recovering from a recent gunshot. Jack Mallory volunteers to go, but he's in the midst of planning an adventure back to 1909 to rescue Amy Spalding. Elliott Fraser volunteers to go, but everyone tells him it's too dangerous and he can't go by himself. Nine adults and five children recite the magic words and appear on Kit Montgomery's doorstep at Montgomery Winery in 1881. Within a 12-hour period, the travelers will be faced with decisions that could rip the clan apart. 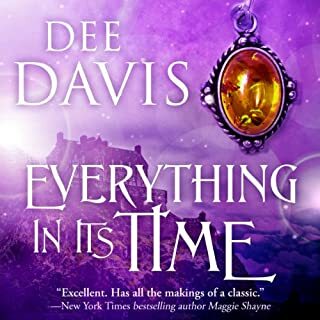 Hang on for a fast-paced time travel historical romance with mystery, suspense, and a bit of paranormal that will keep you on the edge of your seat. I know better than to start a new Celtic Brooch series book before bed, I do…. really. Sadly I could not wait to listen so ended up staying up most of the night. It was so worth it! In this installment a hidden message painted on Kitherina (Kit) MacKlenna's portrait is discovered by James Cullen Fraser, son of Elliott and Meredith. This leads to a great adventure that involves the entire clan. Needless to say there is a wide range of the good, the bad, and definitely the ugly as ‘adventures’ to the past are never straight forward. Like with previous books there is a wonderful mystery or two....or three to solve along the way. Katherine Lowry Logan’s story is as always outstanding and full of surprises in addition to being superbly written. I find her stories send me on an emotional roller coaster, loving every minute… some after I find a tissue. Teri Schnaubelt’s narration is as always outstanding. She expertly portrays the wide range of female and male voices, giving them distinct personalities and vocal patterns. She is definitely one of the most versatile narrators out there. I cannot wait for the next installment, the Diamond Brooch. The Three Brooches is an amazing outstanding novel by author Katherine Lowry Logan. With the entire Celtic Brooch series, she blends time-travel romance perfectly with heart-racing action adventure. As with the prior book in the series, the Broken Brooch, almost the entire MacKlenna Family is featured in this book (about a dozen adults and five children). [If you have not read any of the books in the series before, please read The Ruby Brooch and The Sapphire Brooch before attempting to read this one]. 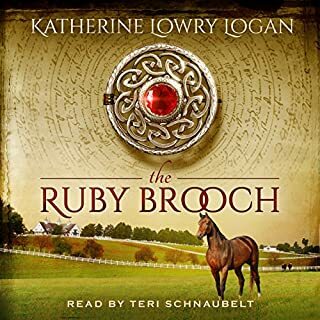 This book centers around the "legend of the three brooches:" when the ruby, sapphire, and emerald brooches are together, their combined power can open a portal to the past. The story basically starts when a message appears in an 135-year old painting of Kit MacKlenna requesting help in the form of insulin for a diabetic. Soon thereafter almost the entire MacKlenna Clan go back to 1881. In the span of about 24 hours a parade of horribles befall on the clan with several main characters in dire jeopardy of losing their lives. Plus Jack Mallory wanders off as he has a tendency to do and before you know it, he's uncovered a plot to overthrow the government using the gold and riches from the Confederates that disappeared after Lincoln was shot. Truly hope there ARE 12 brooches! 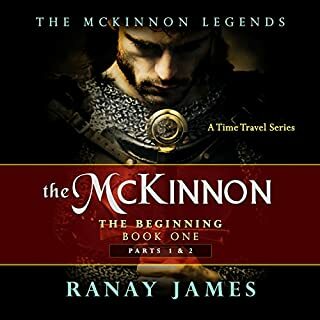 This is one of the best series I've ever listened to...right on the level of the Outlander series by Gabaldon! I truly hope there are 12 brooches so the saga doesn't end. If you haven't already started the series PLEASE read them in order. While they are (supposedly) stand alone books if you fail to read them in order you will miss all the back stories, and often you won't know exactly who each character is. The narrator is easily one of my favorites. Would you consider the audio edition of The Three Brooches to be better than the print version? I love this series of books and can't wait for the next in the series. 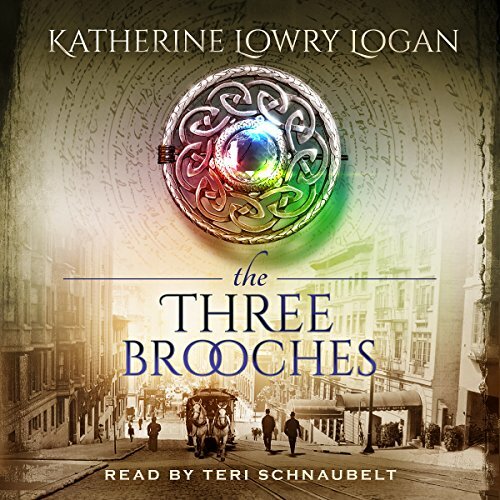 Where does The Three Brooches rank among all the audiobooks you’ve listened to so far? This is one of the best series I have come across. I loved every one of these book. Can't wait for the next one! What other book might you compare The Three Brooches to and why? These are on a par with Nora Roberts books. I liked them that much. Have you listened to any of Teri Schnaubelt’s other performances before? How does this one compare? Teri does a great job with the narration. She brings the story to life. I love the accents she uses for each character. If you love Romance and you love Time Travel you have to read these books! They are some of the best! Awesome Read for saga fans! Loved this reunion book of so many of the series characters to see how the have grown and not...loved the incorporation of next generation. Standing ovation to narrator Teri Schnaubelt so many accents, genders, adults and children often in quick succession! What did you love best about The Three Brooches? The way that the author continue the story with all the key characters. You need to pay attention because each chapter is about different characters. Best one yet in the series. That we get the hear more about Kit and Cullen and how they have survived living in the past. I did listen to in one sitting and I'm now listening to it again . Every time you relisten to any of the book in this series you will hear , Key phrases they you may not have hear the first time. You do not need to read them in order. However I would recommend that. The narration is excellent. I am a big fan of time travel books and these are very good. A great story and a great narrator what more can you ask? I was given this free review copy audiobook at my request and have voluntarily left this review." The continuing saga of the broaches didn't deny another intrigue.... great stoey looking forward to another. Have loved listening to this series hoping for the next book after Diamond Brooch soon.